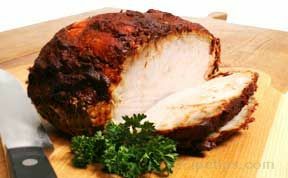 A flavorful turkey breast that is rubbed with a thick sauce that helps it retain its moisture. Cooked on the grill or in the oven this turkey recipe gets a burst of flavor from the rub. Use our Turkey Breast Roasting Times to properly cook the turkey breast. Place the poblano chiles in a small bowl and cover them with boiling water. Let sit for 10 minutes. Place chiles in a colander to drain. When cool enough to handle, cut the stems off and remove any seeds. Add lime and orange juices, garlic, onion and salt. Save 3/4 to 1 cup of this sauce and put it in the refrigerator. Rub turkey with remaining sauce, place on a plate and cover with plastic wrap. Allow this to marinate for at least 2 hours. If grilling, preheat the grill to medium heat. Grill, covered, until a thermometer reaches 165° (1-1 1/2 hours) or roast in an oven covered at 400° for 1 hour and 20 minutes. These times are approximate depending on size of turkey. Transfer to a cutting board, let sit for 15 minutes before slicing. - 1 package of 5 dried poblano chiles - found in the mexican section of your local grocery store.